the wisdom, insights and experiences of our elders! The theme of our 150th celebration is all about telling the stories of our people. But we’re not a nation of lone wolves, howling our tales into a storm – we’re a nation of families founded on a wealth of diversity, legendary principles and a mosaic of multiculturalism. One of Canada’s greatest natural resources is a compilation of the wisdom, insights and experience of its elders. The preservation and understanding of our diversity of foundations is one of the richest gifts we can give to our oncoming generations. Bridge the generation gaps in your family by making the completion of the journal a family project! 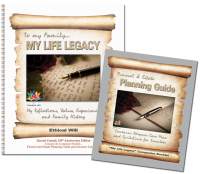 Take the initiative and ensure that your children and grandchildren will have access to the lessons you have learned by completing a My Life Legacy journal for them. Surprise them with your completed journal. Volunteer to take the My Life Legacy journals into retirement homes, therapy centres and individual homes to help seniors and loved ones record wisdom, values and experiences while there is still time. Once completed, the senior will have a valuable gift to give to his or her family for Christmas or another special occasion. If you’re looking for a mentoring tool, To My Family...My Life Legacy makes a wonderful vehicle for communication between the generations. The hope is that many teenagers will spend time with seniors recording their time-tested wisdom. It could provide increased purpose for visits. The My Life Legacy journal is a great idea for a special gift of the heart for any occasion. It’s a wonderful retirement gift. Give a friend or loved one the opportunity to celebrate Canada 150 in a lasting way. Families who find it difficult to engage an elderly or ability-challenged family member in conversation can find their visits part of an exciting journey when they adopt the My Life Legacy journals as a project to complete together, perhaps at the rate of one page per visit. Retirement homes can give the the My Life Legacy journals as welcoming gifts to every new resident, celebrating Canada 150 in an ongoing way. By including the My Life Legacy journals in funeral pre-planning packages, funeral homes can demonstrate how they value the lives of their clients. Baby boomers can take satisfaction in completing the My Life Legacy journal while they still have their faculties, not only to record their history for posterity, but to have a voice into the oncoming generations. Organizations can customize the My Life Legacy journal and give them to their clients as a demonstration of the importance they place on imparting strong values to the oncoming generations. Organize all your personal information into one place, saving your family and executors countless hours of frustration!